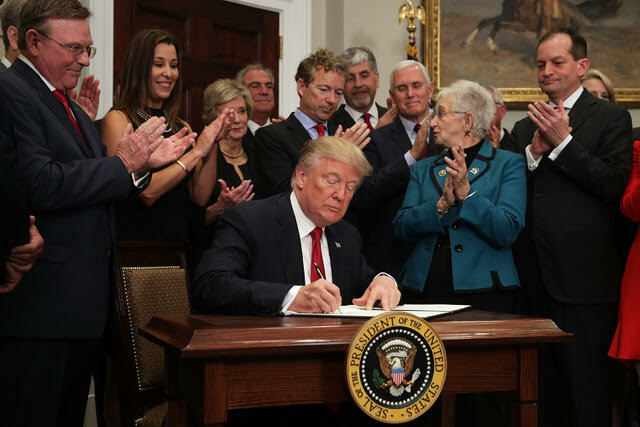 Association health insurance policies are back, designed to appeal to families increasingly priced out of Obamacare’s individual insurance market. These are plans in which small businesses and others band together to buy insurance that isn’t required to satisfy all the Affordable Care Act’s requirements. According to their chief marketer — the Trump administration — AHPs, as they’re called, will lower health insurance premiums for Americans who need individual market coverage. “Many of our laws, particularly Obamacare, make health care more expensive for small businesses than large companies,” said Labor Secretary Alexander Acosta. “AHPs are about more choice, more access and more coverage.” For weeks the government has acknowledged that health insurance sold in the Obamacare market had become unaffordable for middle class families not receiving a subsidy to help pay the premiums — something many of us knew would eventually happen. Business trade groups, fraternal and professional organizations might offer such policies. A single proprietor of a business or a self-employed person could also offer them, according to the administration’s recently released rules. And if the past is prologue, an AHP might be offered by random groups like Taxpayers Network Inc. (TNI), which was set up by an insurance company and snagged a Florida woman named Shaneen Wahl several years ago. Under the new rules, insurance companies can’t set up these arrangements, but there can be plenty of random groups formed to sell coverage as long as their primary purpose is providing benefits as well as some other “substantial business purpose unrelated to providing benefits,” according to Sabrina Corlette, a research professor at Georgetown University’s Center on Health Insurance Reforms. “I don’t think this is a very high bar,” she added. Wahl got caught in an insurance policy death spiral where premiums kept rising, and if she wanted to keep her policy, the insurance carrier said she had to belong to TNI, an association. TNI membership, however, didn’t lower Wahl’s risk for premium increases. Because of the insurer’s practice of “re-underwriting” policyholders, that is, taking another look at their health conditions, those like Wahl, who had developed breast cancer, continued to get hit with annual yearly premium increases as high as 37 percent. The Affordable Care Act’s rule on preexisting conditions outlaws the practice of examining a person’s health before issuing a policy, one of the important consumer protections that law provided. It also eliminated the practice of re-underwriting. And under the government’s new rules for association plans, insurers still cannot factor a person’s health into the decision to issue a policy. Furthermore, all plans must also cover the ACA’s preventive services like mammograms and diabetes screening and cannot charge any coinsurance or copayments for them. Although a carrier still cannot consider a person’s health while issuing coverage, that doesn’t mean someone with health problems is home free. The way benefits are designed can make a policy very unattractive to certain groups of sick people. If a carrier doesn’t want to insure many people with HIV-AIDS, it might include few doctors in its network who will care for those patients. “Benefit design becomes a proxy for medical underwriting,” said Georgetown’s Corlette. Other Obamacare protections are gone, too, giving insurers latitude to fashion policies they hope will attract families now struggling with high premiums. Fewer benefits that pay less are the tradeoff for lower premiums. But will shoppers understand this? When some AHPs arrive on the market this fall, many consumers are unlikely to understand what they are buying. “AHPs will have more flexibility in how they vary premiums and what benefits are covered,” says Cori Uccello, senior health fellow at the American Academy of Actuaries. And that flexibility might be a shopper’s nightmare. For example, policies don’t have to cover the ACA’s 10 essential benefits that include mental health, maternity care, and prescription drugs. And it’s possible the benefits they do offer will come with limitations on hospital stays and doctor visits, and exclude pricey hospitals with well-known reputations. Once again, the individual market may become the wild, wild West of insurance. The “flexibility” touted by the Labor Secretary comes with other unsavory practices, which the ACA eliminated, and will affect who gets insurance and who won’t. The government will permit plan sponsors to use gender in deciding whether to issue a policy and what to charge for it. Before the ACA, women often paid more than men for the same coverage. An insurer once told me that women, especially at younger ages, tended to have more claims than men. In her Health Affairs blog, Katie Keith of Keith Policy Solutions noted a Blue Cross Blue Shield letter commenting on the Labor Department’s AHP proposed rules. It suggests that AHPs could rate — meaning determining what to charge — engineers 9 percent lower than insurers could, and rate taxi drivers 15 percent higher. AHPs could rate young men more than 40 percent lower than insurers, while young women could be rated more than 30 percent higher. Under the ACA, insurers can charge an older person three times more than a younger one for the same policy. With an AHP they could charge older people much more. But perhaps the biggest change is the ability to consider a person’s job in deciding whether to issue a policy at all. Occupational underwriting was also outlawed under the Affordable Care Act, but will now be permitted for association health plans. I looked back at some old stories I wrote for Consumer Reports. In those days it was easy to get a hold of insurance company underwriting manuals that revealed insurance company practices. Beauty operators, doctors, lawyers, models, waiters, musicians, and fry cooks couldn’t buy a policy. Neither could maids, car washers, rodeo performers and movers. People with these occupations tended to file more claims. Today these same folks can buy an ACA policy. Association health plans have a checkered past. “They are not a panacea for our health care woes,” Keith wrote. “Many have left a legacy of insolvency and fraud with millions in unpaid claims for policyholders and providers.” She noted that the much-touted “flexibility” comes with “increased opportunities for mismanagement and abuse.” Many state insurance regulators may not be able to handle the insurance abuse that could await them. Then there’s the question of which state regulates the policies — the one where the insurer is based or the one where the policy is sold, which may have no regulatory jurisdiction over a policy. Shaneen Wahl found out her association was based in Ohio, a state that did not regulate rates for individual policies sold through association groups. But perhaps the biggest unanswered question is whether these plans will reduce the price of health insurance in the long run. For people stuck in the ACA marketplace because they have no association to join or need essential benefits not covered these plans, their premiums are likely to increase as people with better health and fewer needs leave the pool. And those who leave for association plans are not immune from rate increases as time goes on. Association health plans may well throw the individual market into the chaos it suffered before health reform, without actually addressing the fundamental problem these plans purport to solve — the high price of American medical care.